History of the Holidays Bundle! 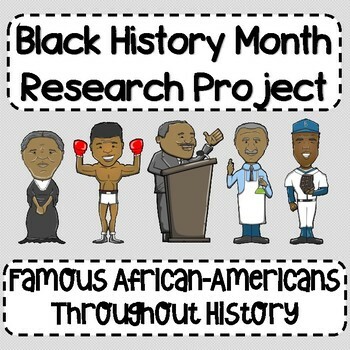 This resource is a research project over famous African-Americans, designed for middle grades! 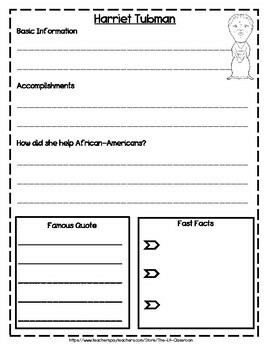 Students will complete graphic organizers through research for the following historical figures: Harriet Tubman, Frederick Douglass, Booker T. Washington, George Washington Carver, Langston Hughes, Louis Armstrong, Jackie Robinson, Muhammed Ali, Dr. Martin Luther King Jr., and President Barack Obama. 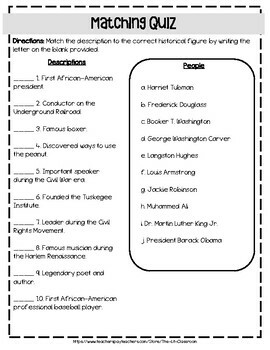 There is a summary quiz for students to complete as an assessment over their understanding of the historical figures. Students will then compose an essay based on their research. 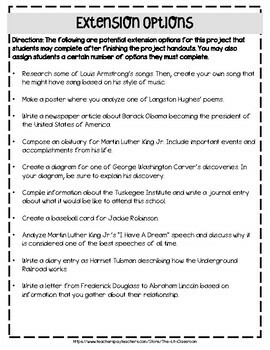 Lastly, there are great extension activities for students to complete that feature higher-level thinking project ideas! Answer key for the quiz is included.